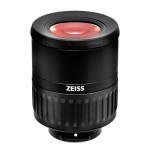 Zeiss has two zoom eyepieces to fit their current Diascope spotting scopes. One is 20-60x on their 85mm scopes and 15-45x on their 65mm scopes. The other is 20-70x/15-56x. These eyepieces lock into the scope body so they do not come loose inadvertently. They will also fit previous (non-locking) Diascope bodies, but the locking feature will not work. Zeiss makes three eyepieces for their excellent DiaScope spotting scopes: a 30x/40x fixed magnification, wide angle eyepiece, a Vario 15-45x/20-60x zoom eyepiece, and a Vario 15-56x/20-75x zoom eyepiece. 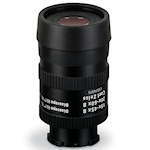 (The eyepiece magnifications vary with the 65-mm or 85-mm objective lens size scope bodies). The compact, lightweight, eyepieces feature the Lotu-Tec water shedding coating and fit all angled or straight configuration Zeiss DiaScope bodies. All Zeiss eyepieces come with a leather pouch, and have locking bayonet-type mounts. Currently there is only one eyepiece for the Harpia scopes. It is a 22-65x zoom on the 85mm body and 23-70x on the 95mm body.